Lyn Rigby was told she could be 'arrested' if she failed to attend the appeal hearing of an internet troll. The jury in the Lee Rigby murder trial have been shown footage of the moment police confronted the men accused of killing the soldier, Michael Adebolajo and Michael Adebowale. Two leaders of far-right group the English Defence League have been charged with obstructing police after allegedly trying to defy a ban on marching to the scene of the murder of soldier Lee Rigby via a major mosque. Tommy Robinson, whose real name is Stephen Yaxley-Lennon, appeared at Westminster Magistrates' Court this afternoon and was bailed to return on September 11. His co-leader Kevin Carroll was also charged after answering police bail and will appear in court on the same day. 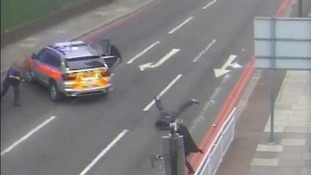 The pair were arrested on suspicion of obstructing officers outside Aldgate East Tube station in east London on June 29. A petition backed by more than 85,000 people calling for bravery medals to be given to three women who intervened in the aftermath of the murder of Drummer Lee Rigby has been delivered to Downing Street. Rector of Woolwich Reverend Jesse van der Valk, who is behind the scheme, said that the trio's courage had given comfort to the young soldier's family. Ingrid Loyau-Kennett was thrust into the spotlight after calmly approaching one of Drummer Rigby's alleged attackers as the young soldier lay injured in the middle of the road. Amanda Donnelly and her daughter Gemini Donnelly-Martin insisted on being allowed to sit with the 25-year-old to try to comfort him. "They showed enormous courage and compassion to Drummer Lee Rigby at what turned out to be the end of his life, and that's an amazing thing. "That's something that people feel strongly about and they want to see them rewarded for what they did. "People see small or major things happening on the street and don't always intervene because of fear of the consequences. These women did and most people think that's something that should be recognised. "I think for Lee himself and for his wife, child and family it has made a big difference to know that they were there. "We hope the Government will recognise what the ladies have done and award them the George Medal." Drummer Rigby, who had a two-year-old son, was murdered near Woolwich barracks in south-east London on May 22. He was hit by a car and then attacked with a meat cleaver by two people. Speaking about the murder of Drummer Lee Rigby in Woolwich, Labour leader Ed Miliband said extremists will fail to divide Britain because "British people know this attack did not represent the true values of any community, including Muslim communities who contribute so much to our country". Mr Miliband said he supported action to bring the perpetrators to justice and work to unite communities and learn the lessons of the attack. But he questioned the Prime Minister on whether the events in Woolwich would mean further movement on controversial communications data proposals. Mr Miliband said, "What is your current view on the need for legislation on communications data?" Mr Cameron replied: "I think we need a frank debate in this House. There is a problem when, at the moment, some 95% of serious crimes involve the use of communications data. "That is not the content of a fixed or mobile telephone call, it's about the nature of the call - when it was made, who was it that made it, when did they make it". Prime Minister David Cameron said the Government's new task force on tackling terrorism and extremism will ask serious questions. Prime Minister David Cameron told MPs the Government will not stand for extremists or "groups like the English Defence League who try to demonise Islam and try and stoke up anti-Muslim hatred". Mr Cameron said in a statement to the House of Commons, "It is as if for some young people there is a conveyor belt to radicalisation that has poisoned their minds". Prime Minister David Cameron has chaired the first meeting of a new task force, known as TERFOR, which aims to tackle terrorism and religious extremism. The task force agreed to tackle all types of extremism "head on" following the murder of Drummer Lee Rigby. A Number 10 spokesman said: "The Prime Minister tasked Ministers to work on practical suggestions which the task force could discuss at future meetings. "He asked Michael Gove and David Laws to look at confronting extreme views in schools and charities, with Vince Cable looking at universities; Chris Grayling to look into similar issues in prisons; and, Baroness Warsi to look at work in communities". Ministers at today's meeting included Chancellor George Osborne, Deputy Prime Minister Nick Clegg, Home Secretary Theresa May and Education Secretary Michael Gove. In a speech in the House of Commons David Cameron paid tribute to the security services and also vowed that the government will not stand for extremists or, "groups like the English Defence League who try to demonise Islam and try and stoke up anti-Muslim hatred." The police and security services will not rest until they have brought all those responsible to justice. Already this year there have been three major counter terror trials in which 18 people were found guilty and sentenced to a total of 150 years in prison much more of the British security services necessarily goes unreported. They are Britain's silent heroes and heroines and the whole country owes them an enormous debt of gratitude. Just as we will not stand for those who pervert Islam to preach extremism, neither will we stand for groups like the English Defence League who try to demonise Islam and try and stoke up anti-Muslim hatred by bringing disorder and violence to our towns and cities. "What happened on the streets of Woolwich shocked and sickened us all. It was a despicable attack on a British soldier who stood for our country and our way of life and it was too a betrayal of Islam and of the Muslim communities who give so much to our country. "There is nothing in Islam that justifies acts of terror and I welcome the spontaneous condemnation of this attack from Mosques and community organisations right across our country."